Like other top overall draft picks, Auston Matthews came into his rookie season with high expectations from fans and collectors. Although the hype did not quite match that of Connor McDavid, Matthews received a lot of attention and he has not disappointed. 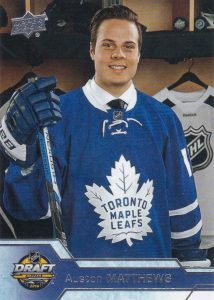 Auston Matthews rookie cards have seen tremendous interest and value thanks to his strong play for the Toronto Maple Leafs. Born and raised in the United States, Auston Matthews has helped re-energize the storied Maple Leafs franchise along with fellow rookie Mitch Marner. Of course, he went through hot and cold stretches, but a strong finish to the season earned him the 2016-17 Calder Memorial Trophy as NHL Rookie of the Year. Shop for Auston Matthews rookie cards on eBay. 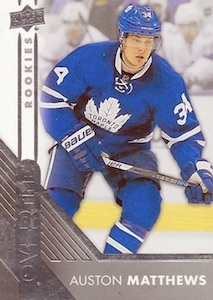 As is typically the case for first-year players, Auston Matthews rookie cards started off slowly with redemptions to begin the collecting season. 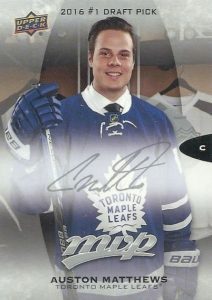 However, the options picked up as new rookie cards featuring Matthews continued to roll out. 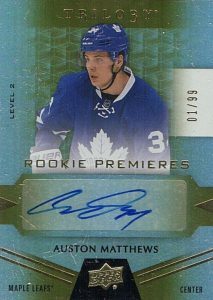 The list below documents all the Auston Matthew rookie cards from 2016-17 hockey releases, including his key base, autographs, relics and other inserts. Both of the Auston Matthews rookie autographs in 2016-17 Fleer Showcase are short prints. The main signed version is limited to 99 while the majority of the Hot Prospects set checks in at 499 copies. In addition, the autographed patch card flips to a horizontal layout and drops the print run to just 35 copies. 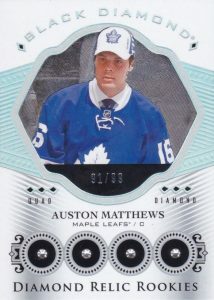 Collectors can also find several 90s-themed inserts for Matthews in greater supply. Although he missed out on the first run of OPC, 2016-17 O-Pee-Chee Platinum puts Matthews on chromium stock. The Marquee Rookies subset is the place for budget collectors to look and the many parallels greatly increase the rarity and variety. 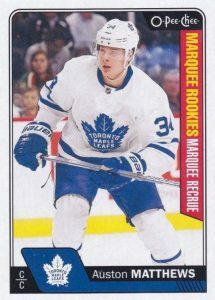 Matthews is also found in the on-card Rookie Auto insert as part of Group A, which has overall odds of 1:501 packs. These also bring with them lots of colorful parallels. 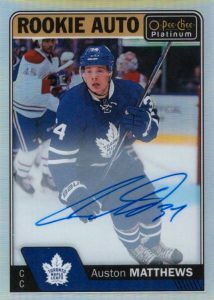 One of his more plentiful options at 999 copies, the Matthews rookie in 2016-17 SP Authentic still offers an on-card signature, making it more available than his other signed RC cards. There is also a limited Black Future Watch Autograph with gold ink. Both signed versions originally came as redemptions. 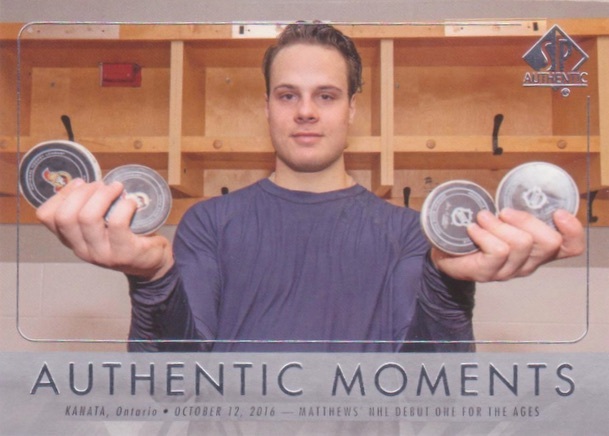 In addition, Matthews is in the Authentic Moments subset with base and autograph versions celebrating his NHL debut. The rarest of the bunch, 2016-17 SP Game Used has Authentic Rookies for the top players that are numbered to their jersey number. For Matthews, that means only 34 copies. While this makes it nearly impossible for the average collector to obtain, parallels are more plentiful. There are also jersey parallels, numbered to 399, as well as very rare autograph and autograph patch versions. One of the more distinct Auston Matthews rookie cards, the Shadow Box Rookies subset in 2016-17 SPx is numbered to 249, but it adds relic and autograph relic editions. 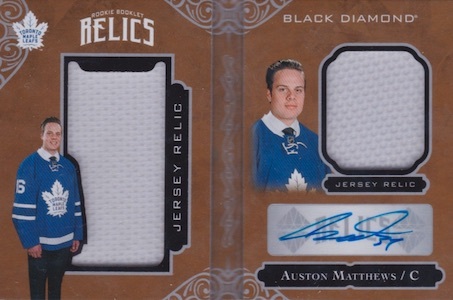 Collectors have also shown considerable interest in the Rookies and Extreme Black Holo Shield Autographs for Matthews. 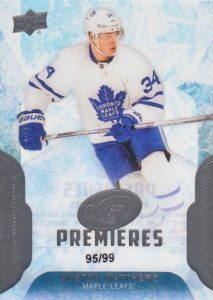 Available in several forms across the primary set, 2016-17 Ultimate gives collectors a base Auston Matthews rookie card in the Ultimate Introductions Rookies subset as part of Level 4, which has overall group odds of 1:12 boxes. He also has a signed Ultimate Rookies cards with an on-card autograph, and one with an autograph patch. The flagship rookie set from UD, the Young Guns line typically offers the most popular cards each year and that is also the case for Matthews in 2016-17 Upper Deck Series 1. Despite the simple nature of the card, values are strong. Plus, rare parallels like the acetate Clear Cut, as well as Exclusives (#/100) and High Gloss (#/10), push prices much higher. Matthews also has a dual checklist card with teammate William Nylander in the base set (#250), along with a very limited NHL Draft short print card that is shown below. 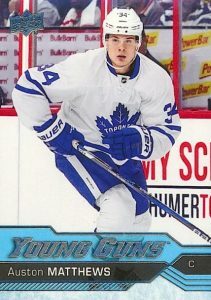 Although his primary Young Guns cards arrived in Series 1, 2016-17 Upper Deck Series 2 is the place to find the Auston Matthews UD Canvas YG card. In addition, despite missing out on the main OPC set, his base O-Pee-Chee rookie is still an option thanks to an update in Upper Deck Series 2. He has both the standard Marquee Rookies subset and the Retro variation. 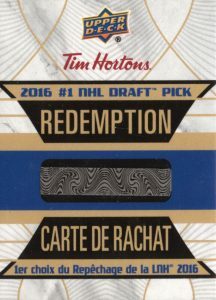 One of the earliest '16-17 cards that can be tied to Matthews, most collectors suspected these 2016-17 Artifacts redemptions would yield Auston Matthews rookie cards despite not naming him on the card. 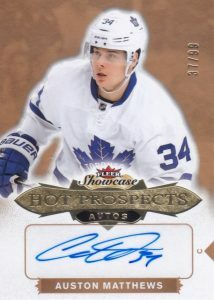 Upper Deck later confirmed both for the Maple Leafs' young stud. The base rookie is on the left while card #I comes as various relics and autograph editions. 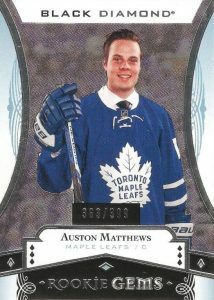 Because of several delays, 2016-17 UD Black is the final Auston Matthews rookie card issued for the season instead of The Cup. The set includes the main Matthews option in the Lustrous Rookies subset. Hard-signed, Matthews is a short print with just 99 copies. He is also in many of the autographed inserts. Taking the name quite seriously, 2016-17 UD Black Diamond includes actual diamonds in the primary rookie set. The Diamond Relic Rookies also come in single, double and triple form, with Matthews as the sole quad diamond rookie. 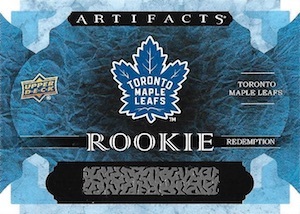 Also worth noting is the Rookie Gems insert for Matthews that is a bit more affordable and plentiful at 399 base copies. 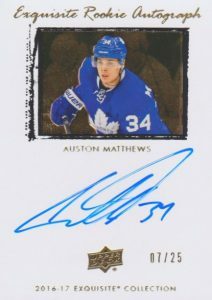 2016-17 Black Diamond provided some of the earliest Auston Matthews autographs, as well. While the premium set offers several different insert choices, all are still limited. This includes the signed Rookie Booklet Relics card below. He also has notable autographs in Signature Rookie Materials and Silver on Black Signatures (redemption). Part of the high-end brand without a true home of its own, 2016-17 Exquisite Collection is actually found exclusively in other products. Collectors' first shot at Auston Matthews' Exquisite cards came in 2016-17 Black Diamond. 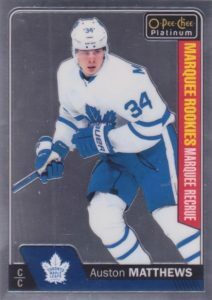 In addition to his Rookie Draft Day and several different rookie relics, he also has a low-numbered Rookies card that is limited to his jersey number (#/34). Round two of Exquisite Collection arrived in 2016-17 UD Ice. With it came a pair of Auston Matthews Exquisite autographs, including a 2009-10 tribute numbered to just 25 copies. Lastly, there was 2016-17 The Cup, featuring the RAP (#/34), and Endorsements auto relic (#/50). 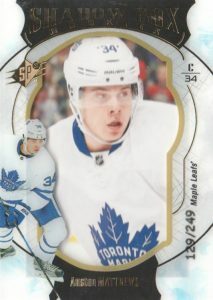 As NHL collectors know, UD ICE means acetate, and for Auston Matthews, the end result is extreme rarity. Included in Level 1 of the 2016-17 Upper Deck Ice Premieres subset, Matthews only has 99 cards and prices are steep. He also has a signed version numbered to 25. Another early redemption option, Auston Matthews is included in 2016-17 Upper Deck MVP with a 2016 NHL #1 Draft Pick card that comes in base and autograph editions. In addition, he is part of the Atlantic Division Rookie redemption set. Collectors can find exclusive physical completion award cards, shown below on the right, through ePack for those that make the digital set. 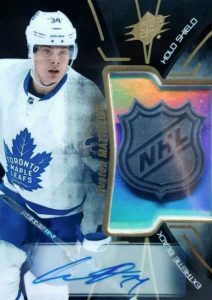 Issued in a distributor-exclusive promo set, Matthews has a base rookie and a blue uniform image variation in 2016-17 UD Overtime Hockey. Both came in Wave 3 packs. Solicited as a Canada-only release at Walmart, collectors across both Canada and the United States have found the retail offering. 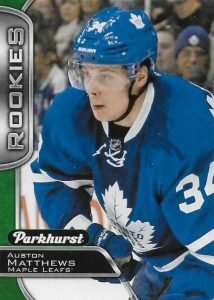 2016-17 Upper Deck Parkhurst is a low-end set, but the deep base checklist includes an Auston Matthews rookie card. This is not to be confused with the blaster-exclusive Parkhurst Rookies Preview insert from '16-17 UD Series 1, shown on the right, that has a similar design. 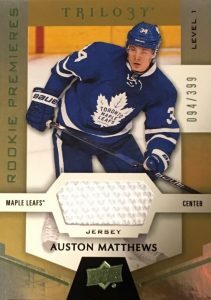 The acetate Rookie Auto Patch in 2016-17 UD Premier has everything an Auston Matthews' collector is looking for in a rookie card. 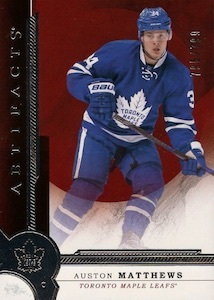 Limited to 199 copies, the moderate jersey swatch is centered between an image of Matthews and an on-card signature. With just 99 copies, 2016-17 Upper Deck The Cup is the Auston Matthews rookie card to own if your budget allows it. The ultra-premium brand has no match among NHL cards. Matthews also has several other impressive autographs in the product, including the 2005-06 Tribute autograph patch shown below. In addition, there are several Exquisite Collection inserts. Becoming a frenzied annual tradition, 2016-17 UD Tim Horton's brought collectors one of the earliest shots at Matthews, albeit at a staggering 1:18,000 packs. 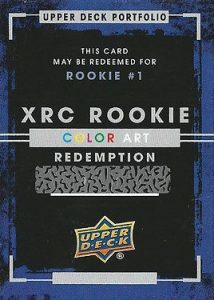 The redemptions are now live and yielding impressive sales. 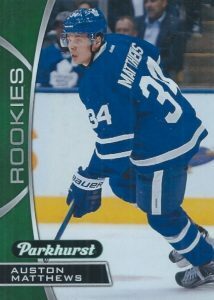 Thrice as nice, 2016-17 UD Trilogy has tiered rookie cards with three main Rookie Premieres options for Auston Matthews. Among these are the Level 1 base cards, Level 2 Uncommon Autographs, and Level 3 Rare Autographs. Unsigned relic cards drop at each level and a triple signature card in Level 3 pairs Matthews with teammates Mitch Marner and William Nylander. No, your eyes do not deceive you. That floating head might not seem all that impressive but it belongs to Auston Matthews. 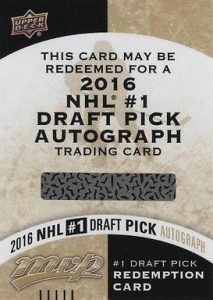 Found in the 2016 UD World Cup of Hockey promo set, this is actually the first live, licensed, and pack-pulled card for Matthews. Part of a late-season release, Upper Deck wasted no time getting Auston Matthews redemptions into the hobby even though the subject was not confirmed until later. 2015-16 UD Portfolio features multiple base and autographed versions for Matthews, who is redemption #1. 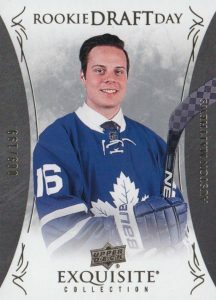 2016-17 Ultimate Collection Achievements Auston Matthews VIP Rookie! 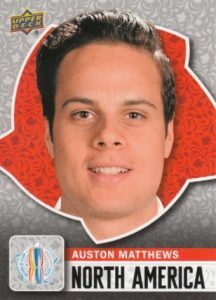 i am curious which is the rookie card for Auston MAthews? there are so many on the market hard to understand which is the real one. Great cards and can’t wait for the recent ones to appear! 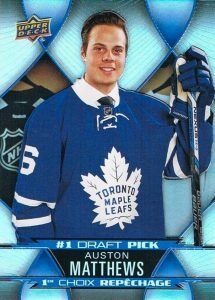 Will there be a complete Auston Matthews rookie card gallery and checklist? I’m pretty sure everything is here. What other sets are missing? His true rookie card and variation from 2016/17 Upper Deck Overtime is not there. 16 17 Upperdeck Black Auston Matthews Obsidian Sig. RC Auto! BGS 9! Mint! POP!